Configuration: 12 boxes per case. As a pillar of the Bowman portfolio, Bowman Draft Baseball has been reinvigorated in 2015 with additional insert subsets, compelling prospect content and a variety of chrome autograph cards! We welcome the 2015 MLB Draft class with new product components that include: - Draft Dividends Insert Cards/Autographs - Teams of Tomorrow Die-Cut Insert Cards - Top of the Class Box Toppers HOBBY ONLY! Bowman Draft Baseball will remain the very first trading card set that features base cards and autographs of the game's future stars in their MLB uniforms! 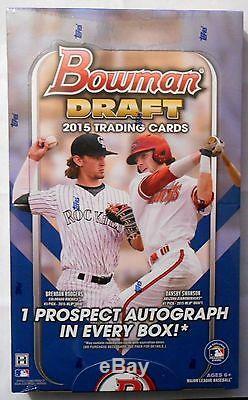 PRODUCT HIGHLIGHTS - Every 2015 Bowman Draft Baseball Hobby Box Will Include 1 Autographed Card! PRODUCT DESCRIPTION NEW CONTENT 2015 Bowman Draft Baseball will contain even more value than in years past, with the addition of collectible new insert and autograph content! New to 2015 Bowman Draft Baseball: Teams of Tomorrow Die-Cut Insert Cards Pairing 2015 MLB Draftees with top prospects from the same organization. Orange Parallel: sequentially numbered to 25. Red Parallel: sequentially numbered to 5. Draft Dividends Insert/Autograph Cards Highlighting players who were originally drafted out of high school, opted to pursue collegiate careers and whose choices paid dividends. Autograph Parallel - sequentially numbered. Orange Autograph Parallel - sequentially numbered to 25. Red Autograph Parallel - sequentially numbered to 5. BASE CARDS The 2015 Bowman Draft base card set will consist of 200 subjects, each with an assortment of colorful parallels. Base Cards 2015 MLB Draft picks and top prospects on paper technology. Orange Border: sequentially numbered to 25. Red Border: sequentially numbered to 5. Chrome Base Cards The same subjects as the base cards, on chrome technology. Refractor - Sky Blue Refractor NEW! - Blue Refractor: sequentially numbered. Orange Refractor: sequentially numbered to 25. Red Refractor: sequentially numbered to 5. AUTOGRAPH CARDS Each HOBBY box of 2015 Bowman Draft Baseball will include 1 autograph card. Chrome Draft Pick Autographs Showcasing ON-CARD autographs of the top 2015 MLB draftees. Prime Pairings Autographs Pairing elite 2015 MLB Draft picks with top prospects who share common bonds, on chrome technology. All-America Game Autograph Cards Autographed cards from previous All-America high school showcase games. ADDITIONAL FEATURES Look for ADDITIONAL features in this year's Bowman Draft Baseball, including: Draft Night Insert Cards Featuring draftees from the 2015 MLB Draft. Top of the Class Box Toppers HOBBY ONLY! Featuring the biggest names from the 2015 MLB Draft class on an oversized chrome card. Orange Wave Parallel: sequentially numbered to 25. Red Wave Parallel: sequentially numbered to 5. Orange Autographed Parallel: sequentially numbered to 25. 2015 SiriusXM All-Star Futures Game Relic Card Showcasing game-used jersey swatches from the 2015 SiriusXM All-Star Futures GameTM. The item "2015 Bowman Draft Factory Sealed Hobby Box Case" is in sale since Monday, October 26, 2015. This item is in the category "Sports Mem, Cards & Fan Shop\Cards\Baseball". The seller is "tntnorthnj" and is located in Tallman, New York. This item can be shipped to United States.